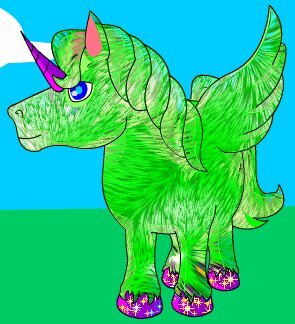 Thunderpony is just one of the many inhabitants of Neopets. Here, you can get to know all about her and where she's from. Maybe you'd like to come and visit Neopia, too! I really think you'd enjoy it. I love going there to play with my pets, play games, and have tons of fun in this virtual world. Doesn't she look lovely when she gets all dressed up? Would you like to know more about her? Here's what she had to say! I am a uni. I am proud, and a little bit mean. I'm not mean on purpose, really, I'm just watching out for myself. I am careful and determined, and stand my ground. I love adventure and try to get as much of it as possible. I really love my owner and I think I am the luckiest pet in all Neopia. When I'm not playing with my owner, I love to play games and hang out with my friends. I collect Usuki dolls. Click here to view my toy gallery! I have a few items that I think are pretty cool. Wanna see them? I also have some special toys! See? This is Thunderpony's Cartoon Doll collection! Go to http://mermaiden.net/Dolls to visit her owner Mermaiden, who built these dolls especially for her. She doesn't want anyone else to take them, but if you copy them, PLEASE link back to her site. Do you and your Neopets love to collect cartoon dolls together? Then join our Neoring - see details at http://mermaiden.net/Neopets/dollpetring.html! Here are MY Neopets tips for you. 1) When you play games, don't forget to submit your score at the end. This is how you get Neopoints! It's easy to click restart when you don't mean to, or even to submit the score when you meant to go to the next level. So just pay attention and read before you click. :) One other note, however. Some games only allow you to get points on the first 3 times you submit. So don't submit your low scores, just play again until you get a higher one. You'll get more NP this way! Some games aren't this way, they give up to x amount of points per day. 2) Buy a shop. You can sell things there that you don't want anymore. You can also sell things you get from the Money Tree that you don't want. If you start off small, you can make a few Neocoins in no time. :) Don't sell them for too much, that's the trick. You can even buy a few cheap toys at the gift shop, if you're fast enough, and sell them in your shop. ALWAYS haggle when you purchase something. I start my offer with about half of what they're asking. Just don't haggle for too long, the item may sell out. Then you can sell the item for its recommended value, and be making a few Neocoins back! You can use the Shop Wizard to search for the item name and see how much other people are selling for. Sell low, and you'll sell stuff fast. People are often looking for random items for quests. 3) Your pet will become hungry after a while. You can buy food in the shops, but anytime you have less than 1000 Neopoints (either on hand or in the bank, it counts the total you have), you can feed your pets for free at the Soup Kitchen. So don't spend all your money trying to buy food. Eventually you will find some, and be able to get some free if you visit the Money Tree. Bookmark and frequently visit the "Pet Quick Ref" page to see how your pet is doing. If they're bored, get a toy and play with them! Take them to explore. You will be given random items sometimes, too. 4) Definitely take advantage of the refer-a-friend program! Justlook at the cool prizes! Include the link on your email signature, put the link on your homepage, tell your friends, whatever works for you.